Sumter, South Carolina (CNN) - Mitt Romney gave a handful of cash Saturday to a woman who had told him she was struggling financially after an event in Sumter, South Carolina. An aide said the GOP candidate gave the supporter "what he had on him" - about $50 or $60. The woman, Ruth Williams, met Romney earlier in the week and told him she was having trouble making ends meet. 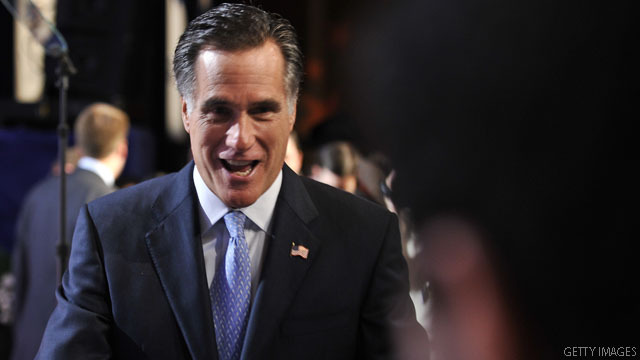 On Saturday, Romney recognized Williams while he was shaking hands with supporters after a rally, an aide said. Romney spoke to the woman and handed her several bills. "He was kind to me," Williams said. "He held onto me and he made Gov. [Nikki] Haley and them come see about me." Williams told reporters that on Wednesday she had seen Romney's campaign bus on the highway and followed it to an airport. Aides then invited her to come meet the former governor at an event in Columbia. "I was on the highway praying and said, 'God, tell me how to get [my] lights on, and I pulled up to a stop sign and his bus was there,'" Williams said. Williams has been out of work since October and is caring for an ill son. She said that after meeting Romney she had also met South Carolina state treasurer and Romney supporter Curtis Loftis, and said he had given her money. She said she used the money to pay her light bill. A Romney campaign aide confirmed Loftis had given Williams money. Williams has been volunteering at Romney's state headquarters in Columbia since the original meeting, she said. "God didn't tell me to go to nobody else," she said when asked whether she had approached other presidential candidates. "He told me to pray for Romney." The cash gift is notable from a candidate who has said he would not give away "free stuff" as president but rather would focus on cutting back on federal spending and stimulating private sector growth. "I know there are some people who run for president that will say, 'Hey, I'm going to give you more. I'll find a way to give you some more. I'll change the rules and give you more money," Romney said at a December event in Conway, New Hampshire. "I'm not that guy. If there's a competition for who will give you the most free stuff, go vote for that guy." So Lets see the BHO gave millions of Other Peoples Money to buy health care votes, gave millions of Other Peoples Money to people who bought houses they never should have, had millions of people drooling saliva because they thought the BHO was going to pay their bills with Other Peoples Money yet the Left are P'ing and moaning about Mitt giving a few bucks of his own money away. You all are funny lol. I am a firm advocator of if it is yours, your free to do what ever you want with it. Come on 2012!! So he is a bad guy for giving a lady a couple of bucks? People are so negative all the time. No matter if you like a guy or not doesn't mean everything a person does has to be put down or looked into as a political gain or media opportunity. So what if he is a rich guy that gave a lady some money get over it. She seems ok with it so why is everybody so mad? So Lets see the BHO gave millions of Other Peoples Money to buy health care votes, gave millions of Other Peoples Money to people who bought houses they never should have, had millions of people drooling saliva because they thought the BHO was going to pay their bills with Other Peoples Money yet the Left are groaning and moaning about Mitt giving a few bucks of his own money away. You all are funny lol. I am a firm advocator of if it is yours, your free to do what ever you want with it. Come on 2012!! What they left out of the article is the part where he asked her to buy some magical underwear with the money. At least 5.000 thank u so much.